I was on the phone with the CEO of a gold mining company. His company operates in Mexico and Canada, and he was thrilled. “Gold stocks are barely moving right now,” I countered. “I know. There are still bargains to buy out there. 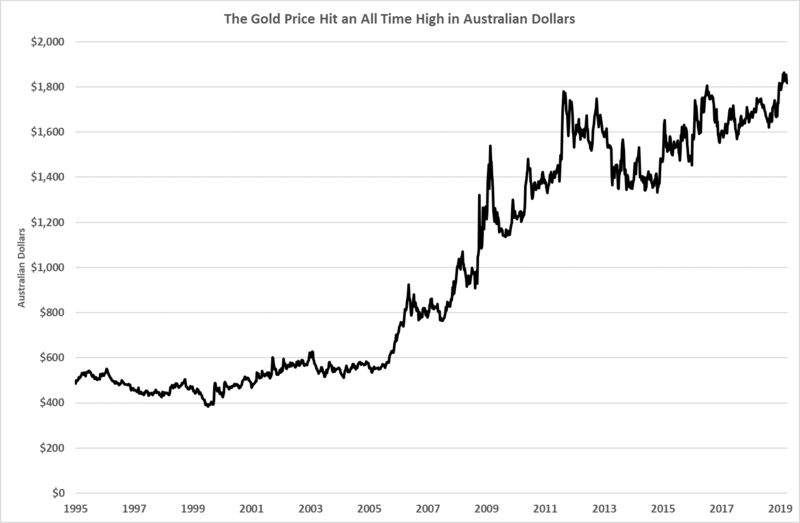 Follow the gold price … it’s ripping in places like Australia,” he responded. Move Your Gold Investment Outside the U.S. Turns out, it’s a great time to be a gold miner … outside the U.S. If you produce gold in Mexico, Canada or Australia, you are making a ton of money. That’s because gold priced in those currencies is at or near all-time highs. And you get to pay your workers in those currencies. That means your costs are low. At the same time, the stuff you produce — gold — is ripping higher. As you can see from the chart below, the price of gold hit $1,871 per ounce in February 2019 … its all-time high. We can use this to our advantage by finding companies that operate in places that have high gold prices. First, the companies can sell their gold at high prices. Second, high gold prices reflect weak currencies. So, they are paying mine costs in the local currency. It works well. That reflects strong cash flows from operations. It did that while spending nearly $300 million every quarter on operations. Companies that operate in places like Mexico, where the gold price is within 10% of its all-time high, will have that tailwind. As will companies that operate in Canada (within 3% of its all-time high) and South Africa (within 11% of its all-time high). However, the reverse is also true. Companies mining gold in the U.S. have a headwind compared to their peers. They are selling gold that’s well below its high. And they are paying costs in one of the strongest currencies in the world — U.S. dollars. I strongly recommend that you hold gold miners in your portfolio right now. We see a solid bull market emerging in gold and precious metals into 2019. And if you want to find the companies that will outperform their peers, stay out of the U.S.
As my Canadian friend said, focus on miners operating in Australia, Mexico, Canada and South Africa. They will be the biggest winners in this bull market. P.S. I took my friend’s words to heart. We just added an excellent gold miner to the Real Wealth Strategist portfolio. It operates mainly in South Africa. We’re taking advantage of that currency tailwind to boost our gains.